AdDuplex, the largest cross promotion network for Windows Phone apps, has launched the first cross promotion network for Windows 8. 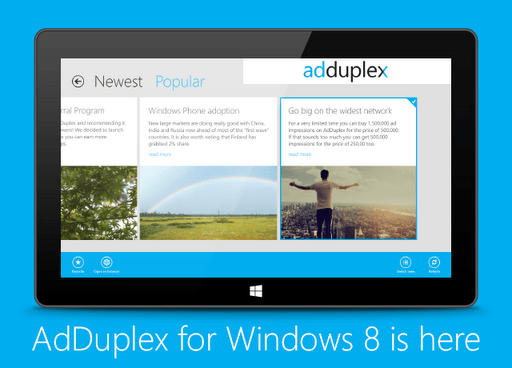 Starting today developers of Windows 8 apps can help each other get more exposure for their apps for free by participating in the AdDuplex ad exchange program. At this time only the managed XAML/C#/VB metro-style apps are supported, but support for other app types is coming. While the Windows 8 SDK is in beta, you will get a better exchange ratio on the AdDuplex network (0.9 instead of 0.8) as well as additional launch bonuses. The first 5 Windows 8 apps to launch on the network will receive 250,000 impression bonus that can be used to advertise both Windows 8 and Windows Phone apps. UPDATE: we now have more that 5 apps using our Windows 8 SDK so the bonus promotion is over, but you can still get 0.9 exchange rate. Help us spread the word to your friends working on Windows 8 apps. Tweet about this, share it on Facebook, via email and other media. Let’s all be awesome! Go big on the widest network – get a million impression bonus!